Anyway, the focus of this particular art-centric post is the following illustration, created by a deviantartist who calls himself "Luce in the Sky." 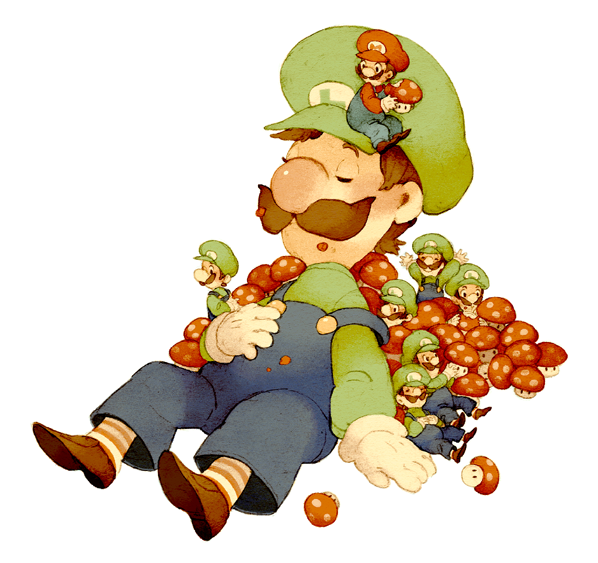 The piece's title is "Dreamy Mushroom Munchers," appropriately enough, and it was produced in honor of Luigi's 30th anniversary. To see more of Luce in the Sky's stuff, check out his deviantart gallery or his brand new (and as such still sparsely populated) tumblr. Those socks! Look at those adorable socks!! The little details in this piece MAKE it. What a great find! The entire gallery is great, especially all the Pokemon and Final Fantasy Tactics Advance art. Oh, yes, I agree. I actually meant to mention the Pokemon art here, by the way, but forgot to do so in the end. Doh! Just a reminder but there's no such thing as too much art posts. This is also a nice reminder to get Dream Team at some point. Thinking about it I still need the got New Super Mario Bros. 2, maybe I'll put both on my Christmas list. Thanks, Sam! It's good to know that not everyone saw this post and thought, Oh, man, another damn art post?! ?